Thank you so much for this article!! I have the G2 and am ready to move onto greener pastures. I'm going to get the Ephrem cutter. Thank you! This will allow you to cut the bottle right at the bottom or very close. You can make a super smooth cut and separation, insert stuff into the bottle and seamlessly bond the bottle back together again. I want to just cut the bottoms off of wine bottles or smaller sized bottles like a Worcestershire bottle. I want not more than an inch of the bottom. Are any of these cutters capable of that? Thank you for all the detailed information. I have been looking at some of the square bottles (mostly from Bourbon makers) and thinking that those bottles could be very interesting vases or light fixtures. I have never cut a bottle before and will probably purchase your A+grade Ephrem's because of the angle/slope on some of the bottles I like best. Thanks again!! I've reviewed a few of the same bottle cutters myself and would agree with all the grades that you handed out. Although I thought you were being generous with the 'D' for the g2. It reminded me of when Tommy Boy got excited and claimed that he 'passed!'. Great round-up of all the different bottle cutters available. I am looking to cut crystal decanters. Would Creator's or Ephrem's work on lead crystal? Kudos on the head to head match-up. I have Ephram's cutter and love it. It gives consistent and even score lines (both in depth and matching the beginning and ending). I have been cutting bottles for about two years. While scoring of the bottle is important, proper stressing of the score line is also important. I used to be very impatient and try to get the bottle cut in two or three passes on the candle. And my success rate was about 50% (terrible). I eventually realized that successful stressing requires patience. I didn't need to overly heat the score line. I needed to evenly apply small amounts of heat, then cool. But do it over more rounds of heating and cooling. Now I take my time and do many passes with heating and cooling. While it may take longer, it insures that the stressing is more likely to follow the score line. Another benefit is that the eventual cut line is very even, and, in my experience, not sharp or dangerous. Because of this, it also requires less sanding. Once I learned some patience, my success rate has gone to about 99%. Hey! THANKS for this!!! This was exactly the comparison test I was hoping someone had done. Really appreciate it. It uses the Bottle Bit to separate the halves with a pencil torch, and then to sand it down. Murrays bottle cutting technique was great. I went back to review video and the video is private now. I has hoping he'd be willing to repost one that isn't private. I bought the items needed and have done bottles I wanted to try to cut. Thanks! Hi are you able to review the Luca and C and C, both look simillar, cant decide between those and the Ephram. Got the g2, and as predicted, 1 out of 10 bottles were barely usable, more the amber than green for some reason green seams more brittle. Thanks for your reviews, really helpful, although wish i'd seen them after spending 2 hours assembling the g2!! I`m truly amazed by the C&C Bottle Cutter. Works like a dream. Please send me the link for that video on the separation technique you,ve been using. I don't mean to pull this thread off on a tangent but I thought I would share what I came up with as the best process for cutting glass bottles. It gives me a way to achieve perfect straight cuts with perfect yoeld 100% of the time. It uses no boiling water, no flames, torches, or combustible gases or liquids. I put together a video and posted the link below. Just one disclaimer: I used Creator's Bottle Cutter in the video because it has worked best for me in my work. If you are tired of reading about bottle scoring devices you can skip the first 3 mins of the video. @Kris--I haven't seen a comprehensive review of the Luca yet. If they'd send me one, I'd gladly add my findings to this post. ;) Think they read these comments?? @Els--I'd never heard of the Kent before reading your comment. They certainly DO look alike, but unless I had one in my hands, I couldn't comment on its performance in comparison to Ephram's. As far as manufacture, Ephram's in made in the U.S., Kent is made in China. Is there any different between the Kent and the Ephrem bottle cutter. On the internet, they look the same? Hi. Thanks so much for your time and energy (and undoubtedly money) spent on these comparisons. They are very helpful. I wonder whether you've heard anything about the Luca Cutter from LucaStudios? (www.lucastudiohk.com). They claim to cut curves & straight lines. You can buy anything on ebay! I think most sellers ship international but be sure to check price. I was warned not to do beer bottles because it is a different type of glass - because of heat processing. I just recently tried a few and had 50-50 luck with a clean cut and getting cracks up the bottle. I was using the G2 and hot water/ice water dipping. 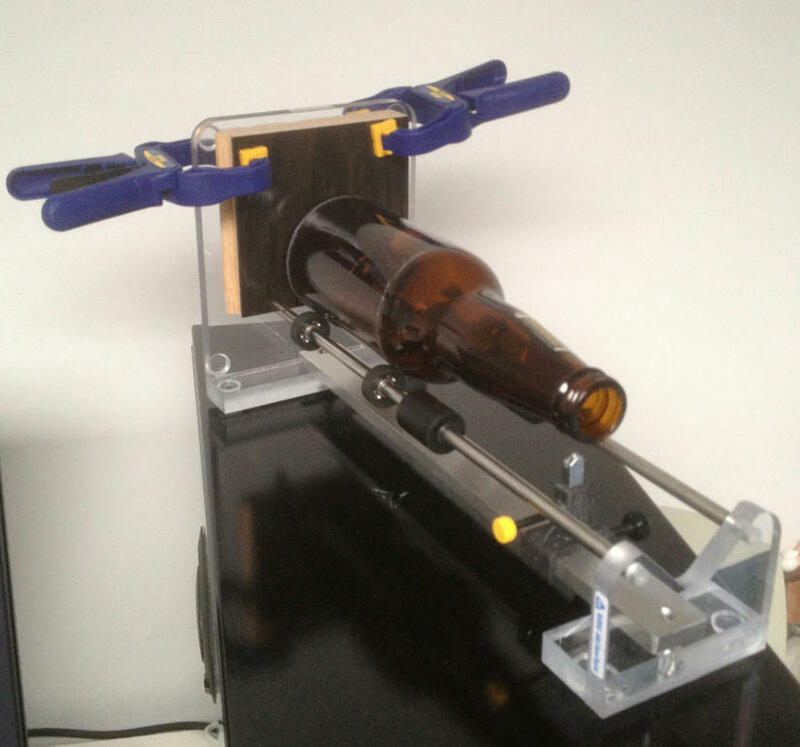 Is it possible to cut beer bottles or bottles of 33 cl (I think of the Savanna-bottles, a South African primium cider) with the Ephrem's bottle cutter? And can i buy the cutter in Belgium?